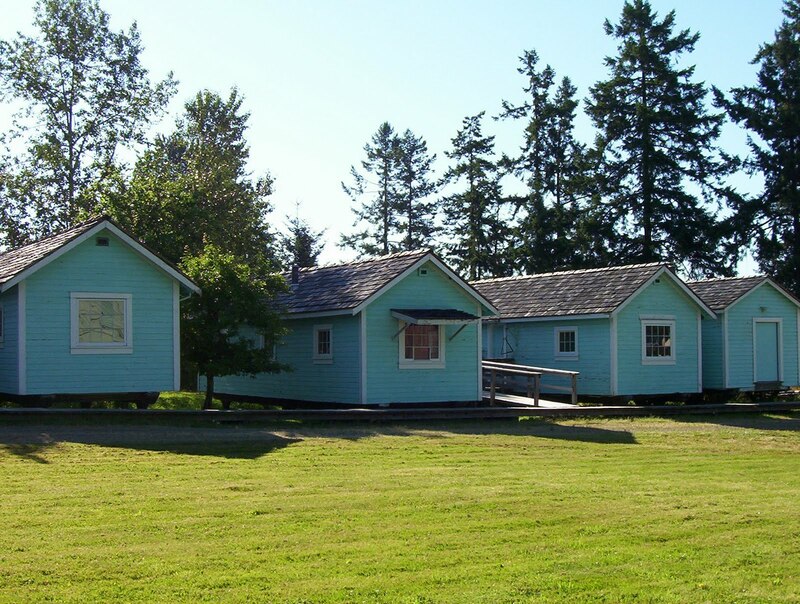 These five bunkhouses that were originally located in logging camps at Copper Canyon (near Chemainus) and Nanaimo. Each building has a different exhibit including the cookhouse, dining hall, surveyor's office, filer's shop, time keeper's office, first aid room, and bunkhouse. These exhibits allow visitors to get a glimpse of life in Vancouver Island's logging camps between the 1930s and 1950s. The cookhouse includes kitchen and dining hall exhibits. Artifacts such as large potato mashers, pots and rolling pins show the challenges of scratch cooking for large numbers of loggers. Many of these artifacts were used in the Cowichan region, and some of the supplies such Quakers Oats and Frys Cocoa are still familiar sights in kitchens today. The second bunkhouse contains the surveyor’s office and filer’s shop. The filer maintained and sharpened axes and saws. Properly set and sharpened saws allowed loggers to fall more timber in a shorter amount of time. The surveyor's duties included mapping land, marking boundaries for logging operations, and planning roads. The timekeeper’s office and first aid room. The time keeper maintained financial records and employee payroll. The first aid room did not have a full-time attendant and an employee who was in the camp during the day (often the timekeeper!) usually attended emergencies. The bunkhouse was considered luxurious compared to living conditions in the early 1900s. It housed eight men, had windows, and there were no bunk beds. The room was heated with a wood stove and there are small holes all over the floor that serve as a reminder of the thousands of caulk boots that walked through its rooms. The summer 2010 painting project involves scraping off all the old exterior paint and applying a fresh coat. The project has been undertaken by both volunteers and staff. Special thanks to the Telus volunteer work party that kicked the painting project off!